Some variation of “single payer” healthcare is going to happen, for one simple reason – the current “healthcare system” is going to blow up. People are broke, fed up, and angry – and support Medicare for All. 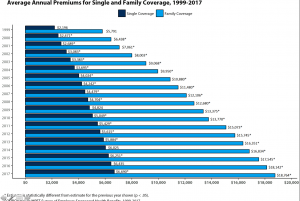 Health insurance is not useful for most of us: many can’t afford the deductibles, and premiums are just stupid expensive. The people running Washington aren’t interested in or capable of fixing anything, they just want to blow stuff up. is a lot easier to understand than the alphabet soup of Medicare A, B, C, D etc. Our last best chance of keeping the “healthcare system” we had was the ACA, a solution rooted in a Heritage Foundation plan that relied on private insurers. When the GOP gutted it, the writing was on the wall. I don’t know when this will happen, I just know that it will. What is the answer Joe? Spencer, thanks as always for the comment. I think the answer is Medicaid or Medicare for all. If you look at the health outcomes for thode systems or the systems in Europe and elsewhere they are significantly better than our average outcomes. You are right Joe. I need to do some more in-depth research on all of this. Many claim that a one payer system is extremely beneficial for European countries but then I hear different stories from people from those countries. Same goes with gun control. I just talked to a guy yesterday from Australia who reported that since the gun compensation occurred that things are a lot worse than they used to be. More thefts, more nurses, more kidnappings, etc. Yet the media reports that all is well in Australia and all these countries that have strict gun laws. Just like all is well in countries that have socialized medicine. So it’s hard to know the real truth especially when it involves media members/reasearchers/ writers that have bias towards what they want to see. I will do some more of my own research. So many different opinions on the matter. So what truly are the facts. Thanks for all your research. Appreciate it. Spencer, thanks as always for your thoughtful comments. I did check Australian. Here’s your friend may want to check with some primary sources here. Joe, perhaps a compromise solution, and a less disruptive one, is to have a Medicare option ( the public option) available to anyone who chooses to purchase it, operating alongside the current employer-based system. Let commercial insurers compete with Medicare, which will likely make them more cost-effective, while Medicare remains an option for anyone not eligible for, or happy with, commercial products. I highly recommend you read Howard Waitzkin’s book, “Health Care Under the Knife”. The authors of the book’s chapters advocate for single payer, as they have diagnosed the cause of the failure of the American health care system, and analyze the problems with the various cures employed to combat the symptoms, but leaves the body of health care still suffering from the underlying disease process. BTW, I like the new format, but the Comment section could be bigger. To those who claim the end of life as we know it. I am now 65 and as of December on Medicare. I have seen doctors since, had procedures, paid my premiums and life continues. The government has not demotivated me, stolen my children, or any of the other scenarios suggested by an earlier comment. How is Medicare good enough for the millions over 65, but not good enough for those who are 64 or 4? Curious minds want to know. Keep and eye on Amazon’s 1492 project. Who knows, this just might end up being the market disrupter that truly changes the game and relegates the Utopian dream of single payer and other obsolete and inefficient insurance and healthcare delivery models to the dustbin of history. Just vaporware at this point but I don’t know of anyone who’s gotten rich betting against these guys. I’m not a big fan of Bezos, but I can’t deny he has a track record of getting some pretty remarkable things done. Beside, I’ll take private industry over a government solution to any problem any day of the week, especially where government is a big part of this particular problem. I have always favored a government backed solution, but then again, that’s my political orientation as well. However; it seems to me that the battle to keep a private health insurance system was lost the day that everyone started agreeing that pre-exisiting conditions had to be covered and that higher premiums could not be charged to folks with pre-existing conditions. Once the GOP discovered that even its own voters wanted coverage for pre-existing conditions, the system (and the GOP policymakers for that matter) had nowhere to go. I mean, come on! Whatever you call a system that covers pre-existing conditions and does not allow premium to reflect risk accurately, you CANNOT call it insurance any more and insurers–at least those that play something close to fair –(as rare as that may be)–cannot profit. So, the product the consumers want; AFFORDABLE coverage that covers everything , preexisting or not, cannot be offered by the private insurance industry. It’s just not how insurance works! A powerful lesson has been learned, the majority wants health coverage or healthcare….and if it is going to cost what it is worth (given the profit motive and given the removal of the rating advantage to insurers) , the public will not pay for it as a free market commodity. So the government has to supply it or at least subsidize it. And since a government subsidy in this instance is SUBSIDIZING PROFIT, it certainly makes more economic sense for the just to supply it and charge for it through the tax system. It probably results in lower taxes (though I do not have any statistics to back this up) for the government to run the the healthcare suystem as if ti were the insurer than to subsidize for-profit insurers. And since the “governement’s money” is OUR tax dollars, our government may indeed be obligated to prroide the service in the least costly way possible. Many people say they want universal healthcare. But they want someone else to pay for it. And they also still want healthcare on demand. Thus the quandry. The Constitution was written at a time when health care was not an issue, but we can no longer live under an eighteenth century constitution that is limited to defending the nation from foreign enemies. In fact, the government did socialize health care a long time ago when they passed an act that gave tax-funded care to merchant sailors entering or leaving US ports, and eventually inland waterways, Read my post https://wp.me/p2QJfz-iT. It would be better to “socialize” health care as you put it, than to let the system implode and leave millions with nothing. Forget what the founders wrote, and consider that constitutions and nations change, and so must we, no matter what you or I think. 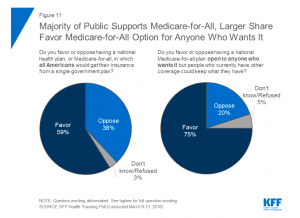 Single payer is coming….get used to it. One flaw in your Medicaid for All scenario. States are already experimenting with benefits and to the detriment of those they believe don’t deserve certain procedures and services they are opposed to. Birth control and abortion services are an example of this. Do you really want Republican governors or legislatures in the future denying some people needed services just because they have a religious or cultural objection? Fascinating dialog. Ideological leanings and political affiliations aside, consider this: America is the only industrialized country where citizens routinely go bankrupt because of a health crisis. Despite being a life-long Republican, my ideal solution would be a base layer akin to Medicaid that provided essential services to all, especially those traditionally served by Medicaid. Next would come employer-assisted and/or private-funded supplements that provide the services most of us are accustomed to receiving: minimal copays and small deductibles, generous benefits for services that are not considered ‘life-saving’, and out-of-pocket caps. Finally, a layer for those who have everything but want even more. Those layers would provide primary, secondary and tertiary coverages, and just like other insurance that provides ‘coverage beyond another policy’ (think umbrella policy in conjunction with homeowners/auto), premium for those add-ons would be drastically lower than they would be if they were responsible for those basic services, too. Those premium savings could be used to fund the base layer for all. In my opinion, the only thing stopping us from achieving this solution – or any other that might actually work – is the mindset of both parties in government that frames the debate into an ‘all or nothing’ proposition. This makes for great TV and scintillating dialog, provides all politicians the very fodder they need to pummel their opponents in the next election, and simultaneously guarantees that no workable solution is anywhere in sight. Arnold – welcome to MCM, and thanks for your thoughtful comments. I’d suggest another major obstacle is the very nature of our health care system – it’s for-profit orientation coupled with unlimited campaign contributions are why politicians won’t change until they are forced to. I believe it has been established that a single payer system would cost taxpayers more money and quality would dramatically decrease. Take the VA for example. What a mess. Many things the government runs fails because they don’t care about the expense or quality as they are a 3rd party. But with that said I think part why this is such a debatable topic and people have such different opinions on it comes down to the fundamental question and belief that people have…is healthcare a right? Do people have the right to healthcare? I would suggest reading this article because I don’t believe healthcare is a right. So until that is agreed upon by everyone there will always be an argument on socialized medicine. I don’t think that has been established; many countries have single payer variants, quality is better, and costs are lower. If there’s some other information out there happy to review. The Washington state WC Fund – L&I – is a “single payer” organization. Quality is very high, costs low, and outcomes exceptional. Ohio’s BWC is making great strides in a number of areas – also a “single payer” organization. Medicare is consistently rated much better than commercial health plans by members. That’s single payer. The VA’s issues are related to recent wars, the high survival rate of catastrophically injured servicepeople, and the lack of funding for those patients. Frankly, the war planners did not consider the aftermath of the wars, and our veterans have suffered as a result. Finally, I respectfully take issue with your statement that “Many things the government runs fails because they don’t care about the expense or quality as they are a 3rd party.” My parents were both career CIA, my sister FBI, my Aunt ran Navy payroll, and all were VERY committed to their jobs, as many government employees are. They ALL cared deeply about what they did, and many local, state, and federal employees feel the same. Like any organization, there are crappy workers, perhaps even in your’s (I know mine has struggles at times). All of us will never agree on any single issue; I certainly don’t agree with the Libertarian’s stance. In fact, I would suggest that the definition of a Libertarian is someone who never had a pre-existing condition and tried to get health insurance in the free market. Because the free market will never insure someone for a pre-ex. Previous Previous post: Let’s call it what it is.